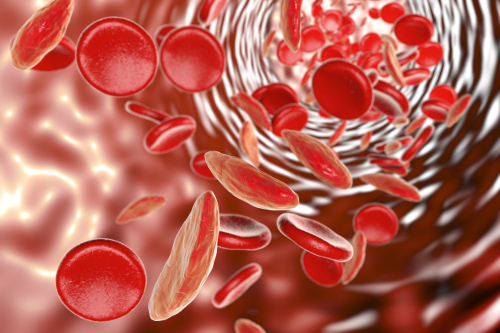 Our red blood cells transport essential nutrients and oxygen throughout the body. These cells are shaped as round flat discs with fat borders to move easily through the bloodstream. If the cells are abnormally shaped, they may have difficulty moving to their destinations. This condition is known as poikilocytosis, and it can lead to serious heath complications as the body will lack the crucial lifeblood. We will look into these problems and learn what symptoms to watch for and the different types of poikilocytosis. The poikilocytosis definition is best described as the existence of poikilocytes in the bloodstream. Poikilocytes are irregular-shaped blood cells. To properly define poikilocytosis, we need to take a look at where the root word came from. Poikilos is the Greek word for varied. When the red blood cell count of these abnormally-shaped cells equals more than 10% of all cells, poikilocytosis exists. This condition hinders the functioning of blood cells, and as a result, diseases and illnesses can develop. External and internal factors can cause poikilocytes to change from their normal shape to these odd-shaped abnormalities. It can lead to life-threatening conditions as poikilocytosis can interrupt the transfer of nutrients from the digestive system, as well as oxygen from the lungs. These are the main causes that will likely result in the development of this condition. We require vitamin B12 for proper nutrient absorption within the small intestine. It also is a key player for red blood cell production. Without a suitable amount of vitamin B12, we may see this production decrease. As a result, neurological and coordination problems, anemia, and of course, poikilocytosis can occur. Most cases can be treated simply by increasing the amount of vitamin B12 in the diet, while more serious deficiencies may receive the vitamin intravenously. Vitamin B9, also referred to as folic acid, is also essential for the production of red blood cells. We often see a lack of this vitamin in pregnancy. It also affects more women than men as it feeds the metabolic requirements and affects the body’s stress and hormone effects. A deficiency in folic acid also can cause anemia and is usually naturally reversed with an increase of green leafy vegetables in the diet. Various health conditions and diseases can cause poikilocytosis to occur. The diseases that impede the necessary absorption of folic acid include leukemia, regional enteritis, tropical sprue, and celiac disease. These all may lead to the immature growth of the red blood cells. Other conditions can include ulcerative colitis, chronic diarrhea, and gut disorders. The shape of poikilocytes can vary depending on the underlying health condition that is causing their abnormal cell structure. We will look at the different types of poikilocytosis based on the composition of the red blood cells. Just as the name implies, the red blood cell forms a teardrop shape with a tip at one end. A condition known as myelofibrosis with myeloid metaplasia can cause these teardrop-shaped cells to develop. The red blood cell appears round and small with no paleness in the center. It occurs with acute burns, hereditary spherocytosis, and some hemolytic anemias such as autoimmune hemolytic anemia. A hemoglobin circulation forms this red blood cell with a look of a bull’s eye. Conditions of hemoglobinopathies such as sickle cell disease, iron deficiency anemia, liver disease, and splenectomy are detected. These red blood cells are crescent-shaped and contain hemoglobin S. This is the tale-tell sign of sickle cell anemia. This red blood cell resembles the shape of a coffee bean. However, under a microscope, its three-dimensional view looks like a cup. It occurs with alcohol-related diseases, heredity stomatocytosis, Rh null phenotype, and liver disease. Referred to as uneven red blood cells, this type of cell appears in various sizes and shapes. Ailments and conditions include hemolytic uremic syndrome, acute burns, macroangiopathic hemolytic anemia, thrombotic thrombocytopenic purpura, and disseminated intravascular coagulation. This red blood cell has a shape similar to a pencil or cigar. It occurs in hereditary elliptocytosis, iron deficiency, myelophthisic anemia, megaloblastic anemia, and thalassemias conditions. With no center paleness, this red blood cell resembles a spur with tiny, spike-like protrusions that can be of various sizes. Myeloproliferative disorders, hepatic disease, abetalipoproteinemia, and neuroacanthocytosis syndromes have an association with this type of poikilocytosis. The condition of the red blood cell can only be detected by examination of a blood sample in laboratory testing. Depending on the results of such a test, you may require further testing such as a vitamin level check and bone marrow testing. The blood tests can vary, as it is also crucial to pinpoint the condition causing the poikilocytosis. Differential Blood Count Test: Determines the amount of irregular red blood cells. Blood Composition Test: Identifies the nutrients and enzymes to check any deficiencies. Hemoglobin Test: Measures the amount of hemoglobin in the red blood cells. Blood Film Test: Shows the shape of the red blood cells under the precise eye of a microscope. It detects the structure of the red blood cell. Once the doctor confirms a poikilocytosis diagnosis and the type is determined, treatment can begin. Serious health conditions will have a specialized treatment management plan. Any nutrient deficiencies may simply require a change in your daily diet. It may include increasing your intake of vitamin B12 and folic acid by adding whole grains, lentils, beet root, cabbage, broccoli, spinach, almonds, soy products, egg yolks, and meat. You may require these nutrients in a supplement form if you follow a restricted vegetarian diet. Some underlying health conditions such as celiac disease require a gluten-free diet. This disease requires a tailor-made diet to address the condition’s dietary needs as well as the deficiencies found in poikilocytosis. You may also require a chemotherapy management plan if cancer caused your poikilocytosis condition. Poikilocytosis is a blood disorder caused by the abnormal structure of red blood cells that equal at least 10% of all red blood cells in the body. For proper functioning, the red blood cells need to be of a particular disc shape. This shape allows them to travel through the bloodstream to supply other cells the essential nutrients and oxygen needed for good health. By having a vitamin deficiency and as an effect of some underlying health conditions, you are at risk for poikilocytosis. Treatment of this condition is based on the cause, as well as the symptoms that may accompany the condition. “Poikilocytosis,” Medical Treasure; http://medicaltreasure.com/poikilocytosis/, last accessed July 7, 2017. “Poikilocytosis – Definition, Symptoms, Causes, Types, Treatment,” Health Care Tip; http://www.healthcaretip.com/2016/06/Poikilocytosis-Definition-Symptoms-Causes-Types-Treatment.html, last accessed July 7, 2017.